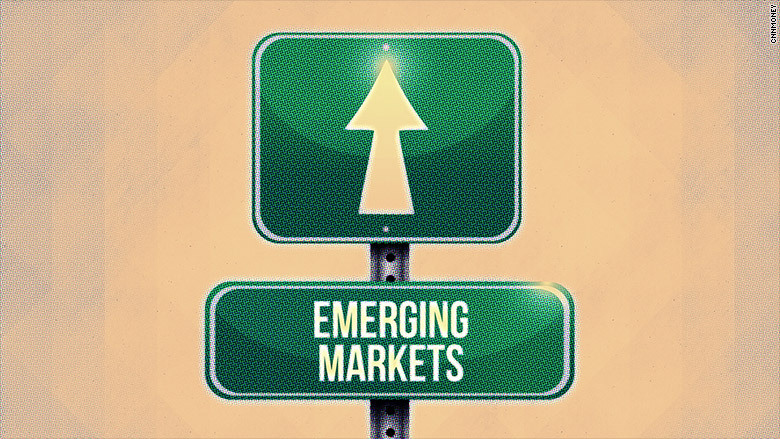 This year was a perfect storm for emerging markets. China's slowdown, a commodity crash, corrupt governments, ISIS threats, the strong dollar, a Fed rate hike... the list goes on. It was the worst year for developing economies -- such as Mexico and Turkey -- since the global financial crisis in 2009. But after five years of declining growth, it appears this broad group of countries has hit bottom and will start to make a comeback next year. 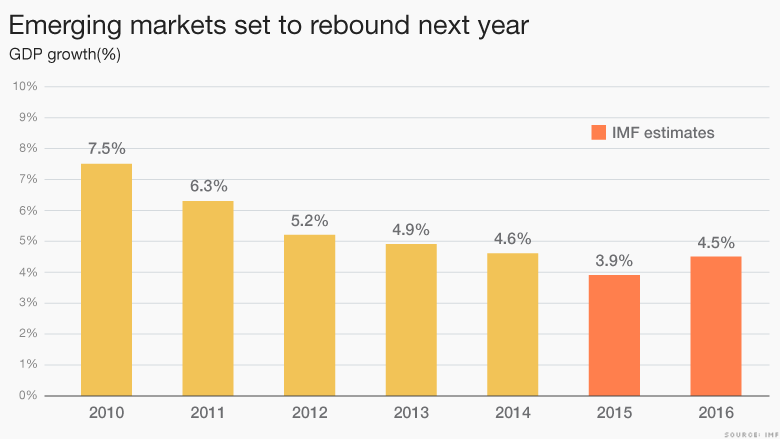 Emerging markets grew about 3.9% in 2015 -- about half as much growth as in 2010, according to the IMF. Next year, growth is projected to climb to 4.5%. But the recovery will be patchy while major potholes still remain, like Brazil's recession, Turkey's debt dilemma and South Africa's currency collapse. First, many emerging markets depend on commodities like oil, iron and copper to power their economy. Commodity prices tanked in 2015. Oil prices hit a 7-year low in December. Oil and other commodities are not poised to boom next year, but they likely won't tumble as much as they did this year, experts say. Low commodity prices aren't good for emerging markets, but stable prices are better than volatile ones. That stability could encourage investors to come back into emerging markets. The world's second largest economy was a serious headwind for emerging markets this year. For years, China had been a major importer of raw commodities from southeast Asia, Europe and Latin America. Now China is transitioning to a consumer-led economy from one led by manufacturing and construction, meaning its demand for all those commodities has plummeted. And it slowed down a lot this year -- China posted its worst economic growth since 2009. The big concern was how quickly the economy was slowing (and whether China's data is even reliable). Chinese officials are pumping money into its economy and cutting interest rates. That "easy money" environment should trickle down and help China's trade partners. Like commodities, many experts believe China's growth may slow down more in 2016, but not at a faster pace. A more stable China bodes well for the countries that depend on it. The dollar also got a lot stronger this year against many currencies in Latin America, Europe, southeast Asia and the Middle East. Brazil's real fell 31% against the dollar, Russia's ruble dropped 17% and Indonesia's rupiah lost 10%. The dollar might strengthen more in 2016, but not at this year's pace, experts say. Its rally is a mix of good and bad news. It's good because a weak currency lets emerging markets sell products abroad more cheaply, making them more attractive to foreign buyers. That eventually boosts exports and, in turn, economic growth. That's a long term benefit. But the bad news is that emerging markets have to pay off some debt in U.S. dollars. In total, there's $3 trillion of emerging market debt denominated in dollars, according to Wells Fargo. As the dollar rallies, that debt gets more expensive to pay back. How expensive that debt gets lies largely on the Federal Reserve and how much it raises interest rates next year. Higher rates often make the dollar stronger. But overall, emerging markets have less dollar debt than they did in past decades, making them less vulnerable to the dollar's rise. Many leaders in emerging markets are actually glad the Fed finally raised rates. So much uncertainty surrounded the first rate hike, and now that it's done, that gives emerging markets more clarity heading into the new year.